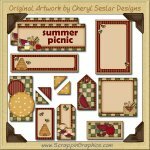 This collection of these prim and country graphics is perfect for all your Summer, picnic, or cook out projects. 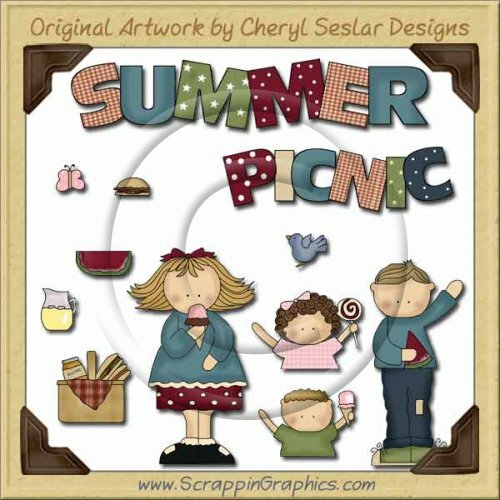 This set includes 12 different clip art graphics: picnic basket, blue bird, boy with watermelon slice, boy with ice cream, hamburger, butterfly, girl eating ice cream, girl with lollipop, lemonade, watermelon slice, PICNIC word art, SUMMER word art. Great collection for making scrapbook pages, cards, labels, tags, invitations, and other printables.